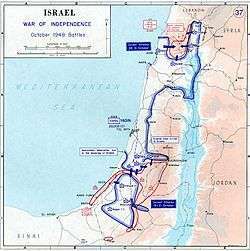 The 1948 Arab–Israeli War or the First Arab–Israeli War was fought between the State of Israel and a military coalition of Arab states, forming the second stage of the 1948 Palestine war. There had been tension and conflict between the Arabs and the Jews, and between each of them and the British forces, ever since the 1917 Balfour Declaration and the 1920 creation of the British Mandate of Palestine. British policies dissatisfied both Arabs and Jews. The Arabs' opposition developed into the 1936–1939 Arab revolt in Palestine, while the Jewish resistance developed into the Jewish insurgency in Palestine (1944–1947). 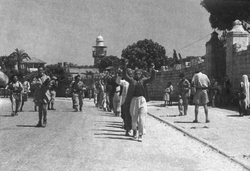 In 1947 these ongoing tensions erupted into civil war, following the 29 November 1947 adoption of the United Nations Partition Plan for Palestine which planned to divide Palestine into three areas: an Arab state, a Jewish state and the Special International Regime for the cities of Jerusalem and Bethlehem. 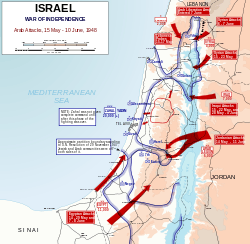 On 15 May 1948 the ongoing civil war transformed into an inter-state conflict between Israel and the Arab states, following the Israeli Declaration of Independence the previous day. A combined invasion by Egypt, Jordan and Syria, together with expeditionary forces from Iraq, entered Palestine – Jordan having declared privately to Yishuv emissaries on 2 May it would abide by a decision not to attack the Jewish state. The invading forces took control of the Arab areas and immediately attacked Israeli forces and several Jewish settlements. The 10 months of fighting, interrupted by several truce periods, took place mostly on the former territory of the British Mandate and for a short time also in the Sinai Peninsula and southern Lebanon. 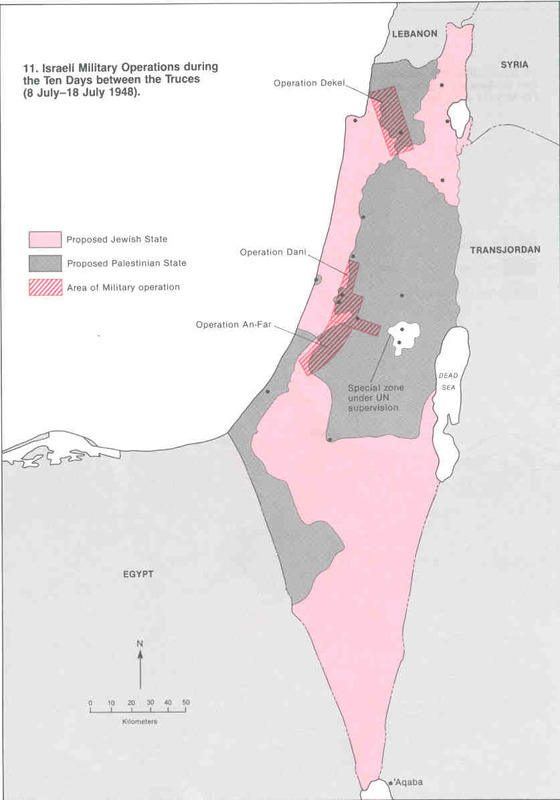 As a result of the war the State of Israel retained the area that the UN General Assembly Resolution 181 had recommended for the proposed Jewish state as well as almost 60% of the area of Arab state proposed by the 1948 Partition Plan, including the Jaffa, Lydda and Ramle area, Galilee, some parts of the Negev, a wide strip along the Tel-Aviv-Jerusalem road, West Jerusalem, and some territories in the West Bank. 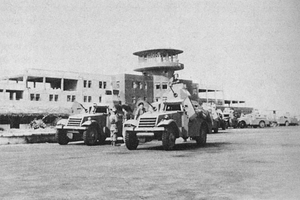 Transjordan took control of the remainder of the former British mandate, which it annexed, and the Egyptian military took control of the Gaza Strip. At the Jericho Conference on 1 December 1948, 2,000 Palestinian delegates called for unification of Palestine and Transjordan as a step toward full Arab unity." No state was created for the Palestinian Arabs. The conflict triggered significant demographic change throughout the Middle East. 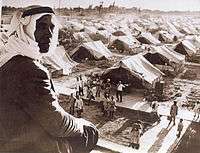 Around 700,000 Palestinian Arabs fled or were expelled from their homes in the area that became Israel and they became Palestinian refugees in what they refer to as Al-Nakba ("the catastrophe"). In the three years following the war, about 700,000 Jews immigrated to Israel with many of them having been expelled from their previous countries of residence in the Middle East. Following World War II, the surrounding Arab nations were emerging from mandatory rule. 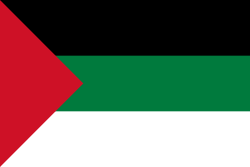 Transjordan, under the Hashemite ruler Abdullah I, gained independence from Britain in 1946 and was called Jordan in 1949, but it remained under heavy British influence. Egypt gained nominal independence in 1922, but Britain continued to exert a strong influence on the country until the Anglo-Egyptian Treaty of 1936 which limited Britain’s presence to a garrison of troops on the Suez Canal until 1945. 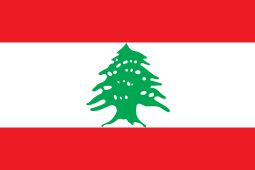 Lebanon became an independent state in 1943, but French troops would not withdraw until 1946, the same year that Syria won its independence from France. Ben-Gurion invested Yigael Yadin with the responsibility to come up with a plan of offense whose timing was related to the foreseeable evacuation of British forces. This strategy, called Plan Dalet, was readied by March and implemented towards the end of April. 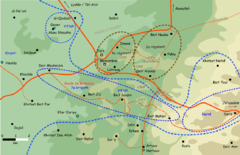 A separate plan, Operation Nachshon, was devised to lift the siege of Jerusalem. 1500 men from Haganah's Givati brigade and Palmach's Harel brigade conducted sorties to free up the route to the city between 5 and 20 April. Both sides acted offensively in defiance of the Partition Plan, which foresaw Jerusalem as a corpus separatum, under neither Jewish nor Arab jurisdiction. The Arabs did not accept the Plan, while the Jews were determined to oppose the internationalization of the city, and secure it as part of the Jewish state. The operation was successful, and enough foodstuffs to last two months were trucked into to Jerusalem for distribution to the Jewish population. The success of the operation was assisted by the death of al-Hasayni in combat. During this time, and independently of Haganah or the framework of Plan Dalet, irregular fighters from Irgun and Lehi formations massacred a substantial number of Arabs at Deir Yassin, an event that, though publicly deplored and criticized by the principal Jewish authorities, had a deep impact on the morale of the Arab population and contributed to generate the exode of the Arab population. The British had, at that time, essentially withdrawn their troops. The situation pushed the leaders of the neighbouring Arab states to intervene, but their preparation was not finalized, and they could not assemble sufficient forces to turn the tide of the war. The majority of Palestinian Arab hopes lay with the Arab Legion of Transjordan's monarch, King Abdullah I, but he had no intention of creating a Palestinian Arab-run state, since he hoped to annexe as much of the territory of the British Mandate for Palestine as he could. He was playing a double-game, being just as much in contact with the Jewish authorities as with the Arab League. The Yishuv managed to clandestinely amass arms and military equipment abroad for transfer to Palestine once the British blockade was lifted. 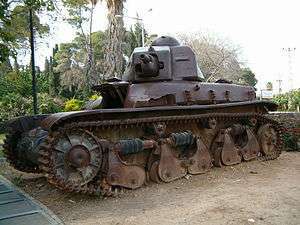 In the United States, Yishuv agents purchased three Boeing B-17 Flying Fortress bombers, one of which bombed Cairo in July 1948, some Curtiss C-46 Commando transport planes, and dozens of half-tracks, which were repainted and defined as "agricultural equipment". 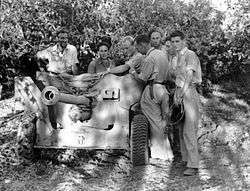 In Western Europe, Haganah agents amassed fifty 65mm French mountain guns, twelve 120mm mortars, ten H-35 light tanks, and a large number of half-tracks. By mid-May or thereabouts the Yishuv had purchased from Czechoslovakia 25 Avia S-199 fighters (an inferior version of the Messerschmitt Bf-109), 200 heavy machine guns, 5,021 light machine guns, 24,500 rifles, and 52 million rounds of ammunition, enough to equip all units, but short of heavy arms. The airborne arms smuggling missions from Czechoslovakia were codenamed Operation Balak. Schwimmer’s operation also included recruiting and training fighter pilots such as Lou Lenart, commander of the first Israeli air assault against the Arabs. 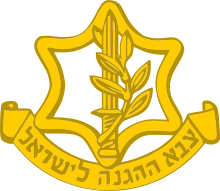 Plan Dalet, or Plan D, (Hebrew: תוכנית ד', Tokhnit dalet) was a plan worked out by the Haganah, a Jewish paramilitary group and the forerunner of the Israel Defense Forces, in autumn 1947 to spring 1948, which was sent to Haganah units in early March 1948. According to the academic Ilan Pappe, its purpose was to conquer as much of Palestine and to expel as many Palestinians as possible, though according to Benny Morris there was no such intent. In his book The Ethnic Cleansing of Palestine, Pappé asserts that Plan Dalet was a "blueprint for ethnic cleansing" with the aim of reducing both rural and urban areas of Palestine. According to Gelber, the plan specified that in case of resistance, the population of conquered villages was to be expelled outside the borders of the Jewish state. If no resistance was met, the residents could stay put, under military rule. According to Morris, Plan D called for occupying the areas within the U.N sponsored Jewish state, several concentrations of Jewish population outside those areas (West Jerusalem and Western Galilee), and areas along the roads where the invading Arab armies were expected to attack. 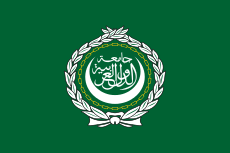 The Arab League before partition affirmed the right to the independence of Palestine, while blocking the creation of a Palestinian government. Towards the end of 1947, the League established a military committee commanded by the retired Iraqi general Isma'il Safwat whose mission was to analyse the chance of victory of the Palestinians against the Jews. His conclusions were that they had no chance of victory and that an invasion of the Arab regular armies was mandatory. The political committee nevertheless rejected these conclusions and decided to support an armed opposition to the Partition Plan excluding the participation of their regular armed forces. British diplomat Alec Kirkbride wrote in his 1976 memoirs about a conversation with the Arab League's Secretary-General Azzam Pasha a week before the armies marched: "...when I asked him for his estimate of the size of the Jewish forces, [he] waved his hands and said: 'It does not matter how many there are. We will sweep them into the sea.'" Approximately six months previously, according to an interview in an 11 October 1947 article of Akhbar al-Yom, Azzam said: "I personally wish that the Jews do not drive us to this war, as this will be a war of extermination and a momentous massacre which will be spoken of like the Mongolian massacres and the Crusades". According to Yoav Gelber, the Arab countries were "drawn into the war by the collapse of the Palestinian Arabs and the Arab Liberation Army [and] the Arab governments' primary goal was preventing the Palestinian Arabs' total ruin and the flooding of their own countries by more refugees. According to their own perception, had the invasion not taken place, there was no Arab force in Palestine capable of checking the Haganah's offensive". Anyway, the Yishuv perceived the peril of an Arab invasion as threatening its very existence. Having no real knowledge of the Arabs' true military capabilities, the Jews took Arab propaganda literally, preparing for the worst and reacting accordingly." King Abdullah was the commander of the Arab Legion, the strongest Arab army involved in the war. However, the Egyptian army was the most powerful and threatening army. 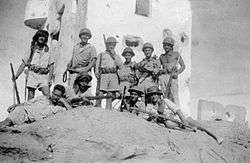 The Arab Legion had about 10,000 soldiers, trained and commanded by British officers. 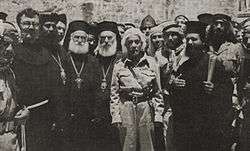 King Abdullah outside the Church of the Holy Sepulchre, Jerusalem, 29 May 1948. Though the state of Israel faced the formidable armies of neighbouring Arab counties, yet due to previous battles by the middle of May the Palestinians themselves hardly existed as a military force. The British Intelligence and Arab League military reached similar conclusions. Syria bought a quantity of small arms for the Arab Liberation Army from Czechoslovakia, but the shipment never arrived due to Hagana force intervention. 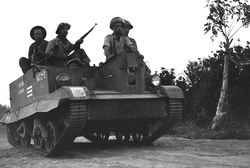 A "Butterfly" improvised armored car of the Haganah at Kibbutz Dorot in the Negev, Israel 1948. The armored car is based on CMP-15 truck. The car has brought supply to the kibbutz. 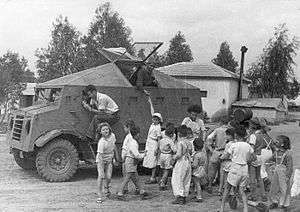 The Negev Kibbutz's children were later evacuated by those cars from their kibbutz, before an expected Egyptian Army attack. 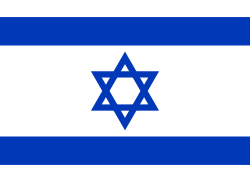 On 14 May 1948, David Ben-Gurion declared the establishment of a Jewish state in Eretz-Israel to be known as the State of Israel, a few hours before the termination of the Mandate at midnight. 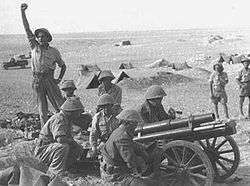 On 15 May 1948, Iraq and the neighboring Arab states, Egypt, Jordan (Transjordan) and Syria, invaded what had just ceased to be the territory of the British Mandate, and immediately attacked Jewish settlements. What was now Israel had already, from 1 April down to 14 May, conducted 8 of its 13 full-scale military operations outside of the area allotted to a Jewish state by partition, and the operational commander Yigal Allon later stated that had it not been for the Arab invasion, Haganah's forces would have reached 'the natural borders of western Israel.' 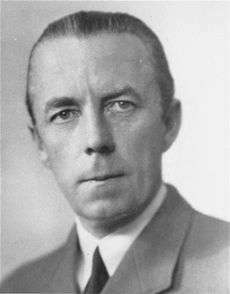 Although the Arab invasion was denounced by the United States, the Soviet Union, and UN secretary-general Trygve Lie, it found support from Taiwan and other UN member states. The initial Arab plans called for Syrian and Lebanese forces to invade from north while Jordanian and Iraqi forces were to invade from east in order to meet at Nazareth and then to push forward together to Haifa. In the south, the Egyptians were to advance and take Tel Aviv. At the Arab League meeting in Damascus on 11–13 May, Abdullah rejected the plan, which served Syrian interests, using the fact his allies were afraid to go to war without his army. He proposed that the Iraqis attack the Jezreel valley and the Arab Legion enter Ramallah and Nablus and link with the Egyptian army at Hebron, which was more in compliance with his political objective to occupy the territory allocated to the Arab State by the partition plan and promises not to invade the territory allocated to the Jewish State by the partition plan. In addition, Lebanon decided not to take part in the war at the last minute due to the still influential Christians' opposition and to Jewish bribes. Intelligence provided by the French consulate in Jerusalem on 12 May 1948 on the Arab armies' invading forces and their revised plan to invade the new state contributed to Israel’s success in withstanding the Arab invasion. One of the Egyptian force two main columns made its way northwards along the shoreline, through what is today the Gaza Strip and the other column advanced eastwards toward Beersheba. To secure their flanks, the Egyptians attacked and laid siege to a number of kibbutzim in the Negev, among those Kfar Darom, Nirim, Yad Mordechai, and Negba. The Israeli defenders held out fiercely for days against vastly superior forces, and managed to buy valuable time for the IDF's Givati Brigade to prepare to stop the Egyptian drive on Tel Aviv. Iraqi forces failed in their attacks on Israeli settlements with the most notable battle taking place at Gesher, and instead took defensive positions around Jenin, Nablus, and Tulkarm, from where they could put pressure on the Israeli center. On 25 May, Iraqi forces advanced from Tulkarm, taking Geulim and reaching Kfar Yona and Ein Vered on the Tulkarm-Netanya road. The Alexandroni Brigade then stopped the Iraqi advance and retook Geulim. On 1 June, the Carmeli and Golani Brigades captured Jenin from Iraqi forces. They were pushed out by an Iraqi counterattack, and lost 34 dead and 100 wounded. The balance of air power soon began to swing in favor of the Israeli Air Force following the arrival of 25 Avia S-199s from Czechoslovakia, the first of which arrived in Israel on 20 May. Ironically, Israel was using the Avia S-199, an inferior derivative of the Bf-109 designed in Nazi Germany to counter British-designed Spitfires flown by Egypt. Throughout the rest of the war, Israel would acquire more Avia fighters, as well as 62 Spitfires from Czechoslovakia. On 28 May 1948, Sherut Avir became the Israeli Air Force. On 3 June, Israel scored its first victory in aerial combat when Israeli pilot Modi Alon shot down a pair of Egyptian DC-3s that had just bombed Tel Aviv. 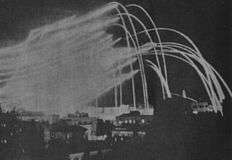 Although Tel Aviv would see additional raids by fighter aircraft, there would be no more raids by bombers for the rest of the war. From then on, the Israeli Air Force began engaging the Arab air forces in air-to-air combat. The first dogfight took place on June 8, when an Israeli fighter plane flown by Gideon Lichtman shot down an Egyptian Spitfire. By the fall of 1948, the IAF had achieved air superiority and had superior firepower and more knowledgeable personnel, many of whom had seen action in World War II. Israeli planes then began intercepting and engaging Arab aircraft on bombing missions. During the truce, Irgun attempted to bring in a private arms shipment aboard a ship called "Altalena". When they refused to hand the arms to the Israeli government, Ben-Gurion ordered that the arms be confiscated by force if necessary. After meeting with armed resistance, the army was ordered by Ben-Gurion to sink the ship. 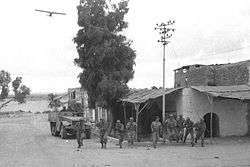 Several Irgun members and IDF soldiers were killed in the fighting. On 8 July, the day before the expiration of the truce, Egyptian forces under General Muhammad Naguib renewed the war by attacking Negba. The following day, Israeli forces launched a simultaneous offensive on all three fronts. The fighting continued for ten days until the UN Security Council issued the Second Truce on 18 July. 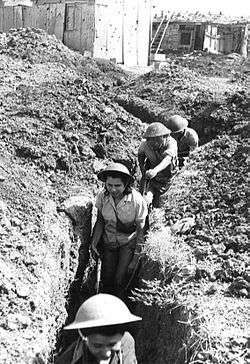 During the fighting, the Israelis were able to open a lifeline to a number of besieged kibbutzim. During those 10 days, the fighting was dominated by large-scale Israeli offensives and a defensive posture from the Arab side. In the south, the IDF carried out several offensives, including Operation An-Far and Operation Death to the Invader. The task of the 11th Brigades's 1st Battalian on the southern flank was to capture villages, and its operation ran smoothly, with but little resistance from local irregulars. According to Amnon Neumann, a Palmach veteran of the Southern front, hardly any Arab villages in the south fought back, due to the miserable poverty of their means and lack of weapons, and suffered expulsion. What slight resistance was offered was quelled by an artillery barrage, followed by the storming of the village, whose residents were expelled and houses destroyed. Operation Kedem aim was to secure the Old City of Jerusalem, but fewer resources were allocated. The operation failed. 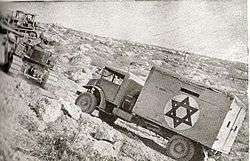 Originally the operation was to begin on 8 July, immediately after the first truce, by Irgun and Lehi forces. However, it was delayed by David Shaltiel, possibly because he did not trust their ability after their failure to capture Deir Yassin without Haganah assistance. The Arab villagers of the area known as the "Little Triangle" south of Haifa, repeatedly fired at Israeli traffic along the main road from Tel Aviv to Haifa and were supplied by the Iraqis from northern Samaria. The sniping at traffic continued during the Second Truce. The poorly planned assaults on 18 June and 8 July had failed to dislodge Arab militia from their superior positions. The Israelis launched Operation Shoter on 24 July in order to gain control of the main road to Haifa and to destroy all the enemy in the area. Israeli assaults on 24 and 25 July were beaten back by stiff resistance. The Israelis then broke the Arab defenses with an infantry and armour assault backed by heavy artillery shelling and aerial bombing. Three Arab villages surrendered, and most of the inhabitants fled before and during the attack. The Israeli soldiers and aircraft struck at one of the Arab retreat routes, killing 60 Arab soldiers.. Most of the inhabitants fled before and during the attack, reaching northern Samaria; hundreds were forcibly expelled during the following days. At least a hundred militiamen and civilians were killed. The Arabs claimed that the Israelis had massacred Arab civilians, but the Israelis rejected the claims. A United Nations investigation found no evidence of a massacre. Following the operation, the Tel Aviv-Haifa road was open to Israeli military and civilian traffic, and Arab roadblocks along the route were removed. Traffic along the Haifa-Hadera coastal railway was also restored. Israeli forces subsequently launched raids into the Nitzana area, and entered the Sinai Peninsula on 28 December. The IDF captured Umm Katef and Abu Ageila, and advanced north towards Al Arish, with the goal of encircling the entire Egyptian expeditionary force. 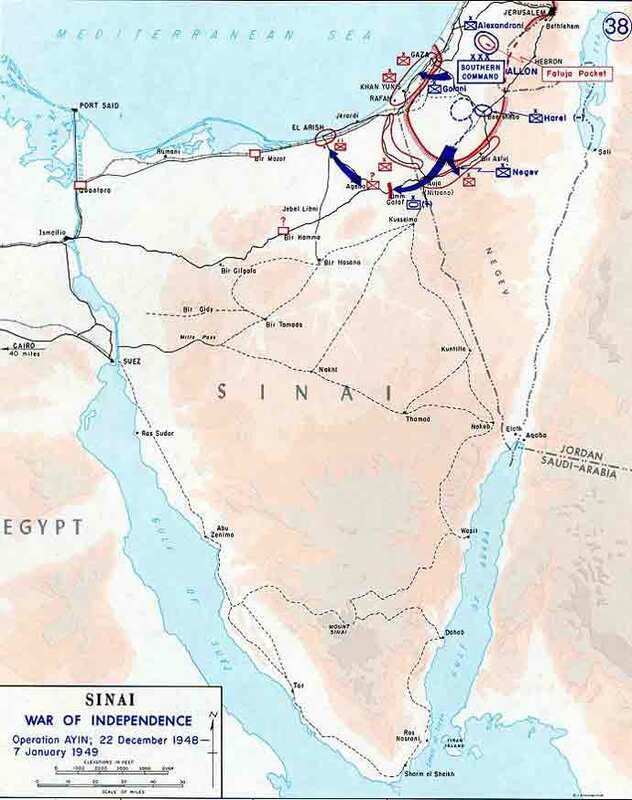 Israeli forces pulled out of the Sinai on 2 January 1949 following joint British-American pressure and a British threat of military action. IDF forces regrouped at the border with the Gaza Strip. Israeli forces attacked Rafah the following day, and after several days of fighting, Egyptian forces in the Gaza Strip were surrounded. The Egyptians agreed to negotiate a ceasefire on 7 January, and the IDF subsequently pulled out of Gaza. According to Morris, "the inequitable and unfair rules of engagement: the Arabs could launch offensives with impunity, but international interventions always hampered and restrained Israel’s counterattacks." On 20 November 1948, an unarmed RAF photo-reconnaissance De Havilland Mosquito of No. 13 Squadron RAF was shot down by an Israeli Air Force P-51 Mustang flown by American volunteer Wayne Peake as it flew over the Galilee towards Hatzor Airbase. Peake opened fire with his cannons, causing a fire to break out in the port engine. 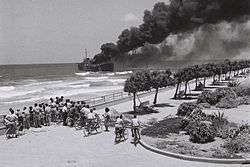 The aircraft turned to sea and lowered its altitude, then exploded and crashed off Ashdod. Both of the crew were killed. In 1949, Israel signed separate armistices with Egypt on 24 February, Lebanon on 23 March, Jordan on 3 April, and Syria on 20 July. The Armistice Demarcation Lines, as set by the agreements, saw the territory under Israeli control encompassing approximately three-quarters of the prior British administered Mandate as it stood after Transjordan's independence in 1946. Israel occupied territories of about one-third more than was allocated to the Jewish State under the UN partition proposal. After the armistices, Israel had control over 78% of the territory comprising former Mandatory Palestine or some 8,000 square miles (21,000 km2), including the entire Galilee and Jezreel Valley in the north, whole Negev in south, West Jerusalem and the coastal plain in the center. This number did not include displaced Palestinians inside Israeli-held territory. More than 400 Arab villages, and about ten Jewish villages and neighborhoods, were depopulated during the Arab-Israeli conflict, most of them during 1948. According to estimate based on earlier census, the total Muslim population in Palestine was 1,143,336 in 1947. 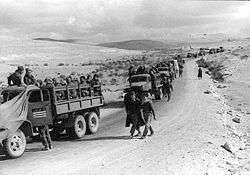 The causes of the 1948 Palestinian exodus are a controversial topic among historians. After the war, around 156,000 Arabs remained in Israel and became Israeli citizens. The Palestinian refugee problem and debate about the Palestinian right of return are also major issues of the Arab-Israeli conflict. Palestinians and their supporters have staged annual demonstrations and commemorations on 15 May of each year, which is known to them as "Nakba Day". The popularity and number of participants in these annual Nakba demonstrations has varied over time. During the Second Intifada after the failure of the Camp David 2000 Summit, the attendance at the demonstrations against Israel increased. The film Cast a Giant Shadow, tells the story of an American colonel who was instrumental in the Israeli victory. ↑ This includes the entire military personnel count – both combat units and logistical units. 3,000–13,000 killed (both fighters and civilians)<ref>Morris 2008, pp. 404–06. ↑ Benny Morris (2008), p. 419. 1 2 Gelber (2006), p. 12. 1 2 Politics and society in modern Israel: myths and realities. Google Books. 2000. ISBN 9780765605146. Retrieved 28 March 2011. ↑ David Tal,War in Palestine, 1948: Israeli and Arab Strategy and Diplomacy, p. 153. 1 2 Morris, 2001, pp. 259–60. ↑ UNITED NATIONS: General Assembly: A/RES/181(II): 29 November 1947: Resolution 181 (II). Future government of Palestine. ↑ Greg Cashman, Leonard C. Robinson, An Introduction to the Causes of War: Patterns of Interstate Conflict from World War 1 to Iraq, Rowman & Littlefield 2007 p. 165. ↑ David Tal, War in Palestine, 1948: Israeli and Arab Strategy and Diplomacy, Routledge 2004 p. 89. ↑ Benny Morris (2008). 1948: a history of the first Arab-Israeli war. Yale University Press. p. 116. Retrieved 13 July 2013. At the time, Ben-Gurion and the HGS believed that they had initiated a one-shot affair, albeit with the implication of a change of tactics and strategy on the Jerusalem front. In fact, they had set in motion a strategic transformation of Haganah policy. Nahshon heralded a shift from the defensive to the offensive and marked the beginning of the implementation of tochnit dalet (Plan D) – without Ben-Gurion or the HGS ever taking an in principle decision to embark on its implementation. ↑ David Tal, pp. 89–90. 1 2 3 4 5 6 Morris, 2003, p. 16. ↑ "A Wing and a Prayer". American Public Television. ↑ Gelber, p. 73; Karsh 2002, p. 25. ↑ Joseph, Dov. "The Faithful City – The Siege of Jerusalem, 1948." Simon and Suchuster, 1960. Congress # 60 10976. pp. 23, 38. ↑ Levin, Harry. "Jerusalem Embattled – A Diary of the City under Siege." Cassels, 1997. ISBN 9780304337651. pp. 32, 117. Pay £P2 per month. c.f. would buy 2lb of meat in Jerusalem, April 1948. p. 91. ↑ "Mi5 Files of Jewish Interest "the activities of Irgun, the Jewish organisation involved or implicated in numerous acts of terrorism in the closing years of the British mandate in Palestine"". Nationalarchives.gov.uk. Retrieved 2014-06-29. ↑ D. Kurzman, "Genesis 1948", 1970, p. 282. ↑ Bregman, Ahron (2010). Israel's Wars : A History Since 1947 (3rd ed.). London: Taylor & Francis. pp. 23, 24. ISBN 0415424380. Retrieved 19 April 2015. 1 2 Morris, 2008, pp. 397–98. ↑ Moshe Naor,Social Mobilization in the Arab/Israeli War of 1948: On the Israeli Home Front, Routledge 2013 p. 15. ↑ Pappe, Ilan. The Ethnic Cleansing of Palestine. 1 2 3 Yoav Gelber, 2006, p. 137. ↑ Henry Laurens, La Question de Palestine, Fayard, 2007 p. 32. 1 2 Gelber (2006), p. 11. ↑ "PDF copy of Cablegram from the Secretary-General of the League of Arab States to the Secretary-General of the United Nations: S/745: 15 May 1948: Retrieved 6 June 2012". Un.org. 2002-09-09. Retrieved 2014-06-29. ↑ "Azzam's Genocidal Threat". The Middle East Quarterly. Fall 2011. Retrieved 6 January 2012. ↑ Rogan and Shlaim 2007 p. 110. 1 2 Sela, 2002, p. 14. ↑ Avi Shlaim (1988). The Politics of Partition: King Abdullah, the Zionists and Palestine 1921–1951. Columbia University Press. ISBN 978-0-231-07365-3. ↑ Tal,War in Palestine, 1948: Israeli and Arab Strategy and Diplomacy, p. 154. ↑ Tripp, 2001, p. 137. 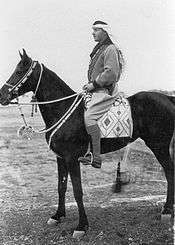 ↑ Gamal Abdel Nasser. "Nasser's memoirs of the first palestine war" (PDF). Walid Khalidi (trans.). Journal of Palestine studies, Vol. 2 no. 2 (Win. 73): 3–32. p. 9. why did the first communique described the Palestine operations as a merely punitive expedition against the Zionist "gangs"
↑ Benny Morris (2003), p. 189. ↑ Morris (2003), pp. 32–33. ↑ Morris (2008), p. 81. ↑ Benny (2008), p. 174. 1 2 Morris, 2003, p. 35. 1 2 3 4 Zamir, Meir (January 2010). 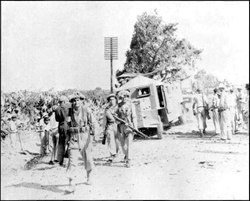 "'Bid' for Altalena: France's Covert Action in the 1948 War in Palestine". Middle Eastern Studies. Routledge. 46 (1): 22. doi:10.1080/00263200903432258. a) the suspension of arms sales to Syria, notwithstanding signed contracts; b) prevention of a large sale of arms by a Swiss company to Ethiopia, which was actually destined for Egypt and Jordan; c) diplomatic pressure on Belgium to suspend arms sales to the Arab states; d) denial of a British request at the end of April to permit the landing of a squadron of British aircraft on their way to Transjordan; e) authorization of Air France to transport cargo to Tel Aviv on 13 May; f) allowing aircraft [carrying arms from Czechoslovakia] to land on French territory in transit to Israel; g) discreet French diplomatic support for Israel in the UN; h) two arms shipments to ‘Nicaragua’, which were actually intended for Israel. ↑ Bregman, Ahron (2002). Israel's Wars: A History since 1947. Routledge. p. 24. ISBN 9780415287166. ↑ Ben Gurion, David War Diaries, 1947–1949. Arabic edition translated by Samir Jabbour. Institute of Palestine Studies, Beirut, 1994. p. 303. 1 2 3 "Wars of the World: Israeli War of Independence 1948–1949". Onwar.com. Retrieved 2014-06-29. ↑ Laurens, vol. 3 p. 69. ↑ Yaakov, Yifa (2014-02-02). 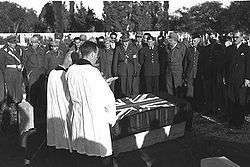 "British deserter who stole tanks for Haganah dies". Timesofisrael.com. Retrieved 2014-06-29. ↑ Gelber (2006), p. 50. ↑ "TRANS-JORDAN: Chess Player & Friend". Time. 16 February 1948. Retrieved 20 April 2010. ↑ Ma'an Abu Nawar, The Jordanian-Israeli war, 1948–1951: a history of the Hashemite Kingdom of Jordan, p. 393. ↑ Benny Morris, Victimes : histoire revisitée du conflit arabo-sioniste, 2003, pp. 241, 247–55. ↑ Pollack 2004, p. ?. ↑ D. Kurzman, 'Genesis 1948', 1972, p. 382. ↑ I. Pappe, "The ethnic cleansing of Palestine", 2006, p. 129. 1 2 Pollack, 2002, pp. 149–55. ↑ Yoav Gelber, 2006, "Sharon's Inheritance" Archived 5 June 2013 at the Wayback Machine. ↑ Rogan and Shlaim 2001, p. 8. ↑ Pollack, 2002, pp. 15–27. ↑ D. Kurzman, "Genesis 1948", 1972, p. 556. ↑ Pollack, 2002, p. 150. ↑ Morris, 2008, pp. 322 and 326. ↑ Uthman Hasan Salih. DAWR AL-MAMLAKA AL-'ARABIYYA AL-SA'UDIYYA FI HARB FILASTIN 1367H/1948 (The role of Saudi Arabia in the Palestine war of 1948), Revue d'Histoire Maghrébine [Tunisia] 1986 13(43–44): 201–21. ISSN 0330-8987. ↑ Morris, 2008, p. 205; cites British diplomatic communications. ↑ Morris, 2008, p. 269. ↑ Morris, 2008, p. 205. ↑ "Communication dated 11 May 1948 from J. Fletcher-Cooke of the United Kingdom delegation to the United Nations Commission on Palestine to Dr. Ralph J. Bunche, Principal Secretary to the Commission: Retrieved 15 December 2013". Unispal.un.org. 12 May 1948. Archived from the original on 12 December 2013. Retrieved 2014-06-29. ↑ Yoav Gelber, Palestine 1948, 2006 – Chap. 8 "The Arab Regular Armies' Invasion of Palestine". ↑ Yoav Gelber (1 January 2006). Palestine 1948: War, Escape and the Emergence of the Palestinian Refugee Problem. Sussex Academic Press. p. 138. ISBN 978-1-84519-075-0. Retrieved 14 July 2013. A war between Israel and the Arab States broke out immediately, and the Arab armies invaded Palestine. ↑ Sean F. McMahon,The Discourse of Palestinian-Israeli Relations: Persistent Analytics and Practices, Routledge 2010 p. 37: "If it wasn't for the Arab invasion there would have been no stop to the expansion of the forces of Haganah who could have, with the same drive, reached the natural borders of western Israel". Walid Khalidi, "Plan Dalet: Master Plan for the Conquest of Palestine," Journal of Palestine Studies, Vol. 18, No. 1, Special Issue: Palestine 1948, (Autumn,1988), pp. 4–33, p. 19. 1 2 Yoav Gelber (2006), p. 130. ↑ "1948: The War of Independence". Jewishvirtuallibrary.org. Retrieved 26 June 2010. ↑ War in Palestine, 1948: Israeli and Arab Strategy and Diplomacy. David Tal. ↑ Benny Morris (1 October 2008). 1948: A History of the First Arab-Israeli War. Yale University Press. p. 218. ISBN 978-0-300-14524-3. Retrieved 14 July 2013. 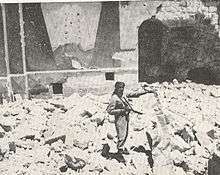 On 26–27 May, the Legionnaires took the Hurvat Israel (or "Hurva") Synagogue, the quarter’s largest and most sacred building, and then, without reason, blew it up. 'This affair will rankle for generations in the heart of world Jewry,' predicted one Foreign Office official. The destruction of the synagogue shook Jewish morale. ↑ Dupuy, Trevor N. (2002). Elusive Victory: The Arab–Israeli Wars, 1947–1974. Military Book Club. p. 49. ISBN 0965442802. ↑ Khalidi, Walid (1992). All That Remains: The Palestinian Villages Occupied and Depopulated by Israel in 1948. Institute for Palestine Studies. p. 480. ISBN 9780887282249. ↑ "Virtual Aviation Museum – RWD 13". Luftfahrtmuseum.com. Retrieved 2014-06-29. ↑ Hayles, John (19 September 1999). "Israel Air Force Aircraft Types". John Hayles, aeroflight.co.uk. Archived from the original on 22 February 2007. ↑ Morris, 2001, pp. 217–18. ↑ Morris, 2008, p. 262. ↑ Aloni, 2001, pp. 7–11. 1 2 "History of the Navy". Jewishvirtuallibrary.org. Retrieved 18 January 2013. ↑ Ahron Bregman; Jihan El-Tahri (1999). The Fifty Years War: Israel and the Arabs. BBC Books. ↑ "The First Truce". Retrieved 22 February 2009. ↑ Alfred A. Knopf. A History of Israel from the Rise of Zionism to Our Time. New York. 1976. p. 330. ISBN 978-0-394-48564-5. ↑ David Tal, War in Palestine, 1948: Israeli and Arab Strategy and Diplomacy, Routledge 2004 p. 307. ↑ 1948: A History of the First Arab-Israeli War, by Benny Morris. Books.google.co.uk. 2008-10-01. Retrieved 2014-06-29. ↑ Kadish, Alon, and Sela, Avraham. (2005) "Myths and historiography of the 1948 Palestine War revisited: the case of Lydda," The Middle East Journal, 22 September 2005; and Khalidi, Walid. (1998) Introduction to Munayyer, Spiro. The fall of Lydda. Journal of Palestine Studies, Vol. 27, No. 4, pp. 80–98. ↑ Benny Morris (1987). The Birth of the Palestinian Refugee Problem, 1947–1949. Cambridge University Press. pp. 203–11. ISBN 978-0-521-33889-9. ↑ Map of the Attacks. ↑ J. Bowyer Bell, Assassination in International Politics, International Studies Quarterly, vol. 16, March 1972, pp. 59–82. ↑ Haberman, Clyde (22 February 1995). "Terrorism Can Be Just Another Point of View". New York Times. Retrieved 28 December 2008. Mr. Shamir, nearly 80, still speaks elliptically about the Bernadotte assassination. Years later, when Ben-Gurion moved to a kibbutz in the Negev desert, Sdeh Bokker, one of his closest friends there was Yehoshua Cohen, who had been one of the assassins. Review of Kati Marton's biography. ↑ Cowell, Alan (2 November 1991). "THE MIDDLE EAST TALKS: REPORTER'S NOTEBOOK; Syria Offers Old Photo To Fill an Empty Chair". The New York Times. Retrieved 28 December 2008. In recent years, several members of the group known by the British as the Stern Gang have acknowledged responsibility for the killing. Mr. Shamir, who was a member of the Stern Gang, has declined to discuss the killing, and one of his spokesman has said he had no role in it. ↑ "Area of Jurisdiction and Powers Ordinance (1948)". Israellawresourcecenter.org. Retrieved 18 January 2013. 1 2 3 Benny Morris (2008). 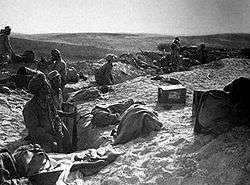 1948: a history of the first Arab-Israeli war. Yale University Press. p. 116. Retrieved 13 July 2013. 'the Little Triangle': Ijzim, Ein Ghazal, and Jaba. The villages repeatedly fired at Israeli traffic along the coast road and were supplied by the Iraqis from northern Samaria. 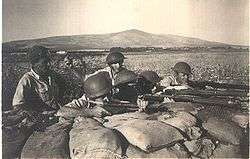 … Sniping at traffic continued after the start of the Second Truce, …on 24 July Israel launched mivtza shoter (Operation Policeman). 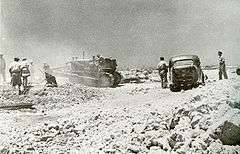 The aim was 'to gain control' of the coast road between Zikhron Yaakov and Haifa 'and to destroy all the enemy in the area. '… By 26 July it was over. Most of the inhabitants fled before and during the attack, reaching northern Samaria; hundreds of others were forcibly expelled during the following days. At least a hundred militiamen and civilians were killed. ↑ Hussein, Hussein Abu (2003). Access Denied: Palestinian Land Rights in Israel. Zed Books. p. 85. ISBN 1842771221. ↑ "Operation Hiram". Zionism-israel.com. Retrieved 2014-06-29. ↑ Khalidi, Walid (1992). 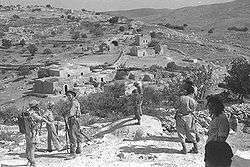 All That Remains: The Palestinian Villages Occupied and Depopulated by Israel in 1948. Institute for Palestine Studies. p. 108. ISBN 9780887282249. ↑ Weissenstein, Rudi; Dvir, Ori (2008). Rudi Weissenstein: Israel Early Photographs. Modan Publishing House. p. 32. ISBN 9789657141106. ↑ Dan, Uri (1988). To the Promised Land: The Birth of Israel. Doubleday Religious Publishing Group. p. 267. ISBN 9780385245975. 1 2 3 4 5 6 7 8 9 "Iaf V Raf". Spyflight.co.uk. Retrieved 26 June 2010. ↑ Aloni, 2001, p. 18. 1 2 3 4 Aloni, 2001, p. 22. ↑ L. Carl Brown (2013), p. 126. ↑ "Legal Status in Palestine". Lawcenter.birzeit.edu. Retrieved 2014-06-29. ↑ Tobin, Maurine and Robert (2002). How Long O Lord? : Christian, Jewish, and Muslim Voices from the Ground and visions for the future in Israel–Palestine. Cowley Publications. ISBN 9781561012145. ↑ Anita Shapira (25 November 2014). Ben-Gurion: Father of Modern Israel. Yale University Press. pp. 173–. ISBN 978-0-300-18273-6. (Ben Gurion) He also did not flinch from provoking the United Nations by breaking the truce agreement. But the limit of his fearlessness was a clash with a Western power. Vainly, the right and Mapam accused him of defeatism. He did not flinch from confronting them but chose to maintain good relations with the United States, which he perceived as a potential ally of the new state, and also not to provoke the British lion, even though its fangs had been drawn. At the end of the war, when Yigal Allon, who represented the younger generation of commanders that had grown up in the war, demanded the conquest of the West Bank up to the Jordan River as the natural, defensible border of the state, Ben-Gurion refused. He recognized that the IDF was militarily strong enough to carry out the conquest, but he believed that the young state should not bite off more than it had already chewed. There was a limit to what the world was prepared to accept. Furthermore, the armistice borders – which later became known as the Green Line – were better than those he had dreamed of at the beginning of the war. In Ben-Gurion's opinion, in terms of territory Israel was satisfied. It was time to send the troops home and start work on building the new nation. ↑ Weinthal, Benjamin (14 October 2012). "Compensation sought for... JPost – Jewish World – Jewish Features". Jpost.com. Retrieved 18 January 2013. ↑ http://www.history.ac.uk/reviews/paper/hughesMatthew.html The War for Palestine. Rewriting the History of 1948 by Eugene L. Rogan and Avi Shlaim . Retrieved 8 August 2009. Archived 11 August 2009. ↑ "Dr. Sarah Ozacky-Lazar, Relations between Jews and Arabs during Israel's first decade (in Hebrew)". Archived from the original on 30 June 2013. Retrieved 29 June 2013. 1 2 "Palestine refugees". Unrwa.org. Retrieved 18 January 2013. 1 2 "Re-claiming Palestine: The Legal Basis for Rights of Return and Restitution". Thejerusalemfund.org. 2 August 2005. Retrieved 18 January 2013. ↑ Joseph Ginat and Edward Joseph Perkins (2001). The Palestinian Refugees: Old Problems – new Solutions. University of Oklahoma Press. p. 140. ISBN 0806133937. In order to highlight the plight of the refugees and to put pressure on Israel to admit responsibility for them, Arab countries (except Jordan) have denied citizenship rights to the Palestinians in their midst; in so doing, they claimed they were serving the interests of the Palestinians and supporting their right of return. ↑ "Jewish Refugees of the Israeli Palestinian Conflict". Mideast Web. Archived from the original on 30 June 2013. Retrieved 1 April 2013. 1 2 Sachar, pp. 395–403. ↑ Displaced Persons retrieved on 29 October 2007 from the U.S. Holocaust Museum. ↑ Tom Segev, 1949. The First Israelis, Owl Books, 1986, p. 96. ↑ Devorah Hakohen, Immigrants in Turmoil: Mass Immigration to Israel and Its Repercussions in the 1950s and after, Syracuse University Press 2003 pp. 24, 31, 42, 45. ↑ "Vi- The Arab Refugees – Introduction". Mfa.gov.il. 2014-06-24. Retrieved 2014-06-29. ↑ המעברות [Transit Camps] (in Hebrew). Lib.cet.ac.il. Retrieved 18 January 2013. ↑ Avi Shlaim, The Debate about 1948, International Journal of Middle East Studies, 27:3, 1995, pp. 287–304. 1 2 Avi Shlaim, "The Debate about 1948", International Journal of Middle East Studies, Vol. 27, No. 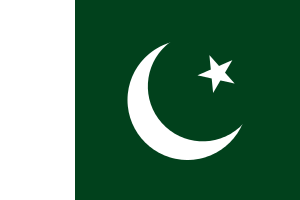 3 (Aug. 1995), pp. 287–304. ↑ "Israeli Air Force, particularly its scrappy beginnings, inspires 3 films". Jewish Telegraphic Agency. Retrieved 2015-12-10.